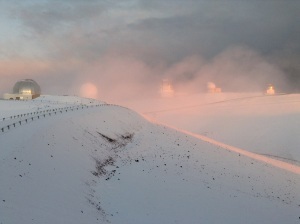 Other worldly, mysterious, shrouded in mist – This picture brings to mind something that should be science fiction. Doug has a way of taking our world and making it seem like some place altogether different. I like that about him. Despite all that, I went a little more mundane. Or did I? “You’d better hope so.” Larry imagined wisps of smoke streaming from her nostrils as she sighed. Grabbing her coat, Angela headed out into the cold. His last view of her was blurred, a scaly tail burning a trail of anxiety in the snow behind her. The last line doesn’t promise a happy ending – Great narration bringing the characters to life. Good work, Erin. This photo does bring to mind another world or another time, doesn’t it? I think the kids will be alright. Larry, however I am not as sure about. Nice… What was the word Doug introduced last week – “drachenfutter”? Larry might want to think about that. So…she actually IS a dragon, and the little dragons really did need to “let off some steam.” Very clever!!! Is that a metaphorical tale (or tail)? We learn a lot about ice dragons this week, I think. 🙂 Great story. Must be the week for “drachenkinder” then. Nice one, they could literally be dragons or his imagination when she storms away. Ooo very intense. Someone is pissed! I know a couple like this… You captured the moment beautifully. Subtle humor that sneaks up from behind. They needed to blow off steam…literally. Love it. Fantastic. I love these characters. Not mundane at all. You throw in the hints about dragons so well all the way through, Erin, but I must admit, I only realised that after I’d read that superb last line. Angela had better find those kids, or Larry’s likely to be frazzled! Well done. I must admit I didn’t realize she was a dragon until I read the comments.